Should I See a General Dentist or an Orthodontist in Columbus, OH? Your teeth are vital for helping you chew and speak while also allowing you to smile confidently. To promote their health, you take the time to brush and floss every day. Did you know that their alignment is equally as important as their health? Unfortunately, most people are not born with a naturally straight smile. If you have gapped, tilted, or rotated teeth, it not only impacts how they look, but it can cause oral health issues to develop as well. 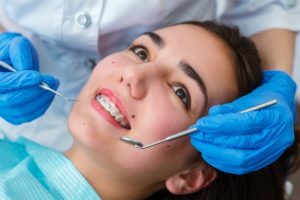 To correct their alignment, your general dentist may offer braces; however, you may want to consider seeing an orthodontist in Columbus, OH instead. Not only do properly aligned teeth look better, but they also improve your oral health as well. When you suffer from alignment issues, your teeth are more difficult to clean. This increases your risk for tooth decay and gum disease. Not to mention, you have a heightened risk for dental emergencies because protruding or rotated teeth will take the brunt of the force during an impact to the mouth or face. This can easily result in a knocked out, dislodged, or broken tooth. To promote your oral health and your confidence, your orthodontist can help. Many general dentists offer braces; however, it is best to see an orthodontist to move your teeth. In addition to graduating from dental school, they have continued their training by two to three years to specialize in the movement of the teeth. This allows them to be a specialist in the field. As a result, they can treat issues that affect their alignment as well as bite problems. Although a general dentist can straighten your teeth, they may not remain current with the latest methods and education in the area; whereas, orthodontists are required to attend regular training to remain well-versed in orthodontics. Due to their advanced training, they can better understand how to create the optimal treatment plan while avoiding any potential complications—even for complex cases. They are better suited to develop the individualized solutions you need to achieve a healthy, straight smile. If you are ready to start your journey to improved oral health and confidence, it is time to schedule a consultation with your orthodontist. After performing a comprehensive examination, they will discuss your treatment options to help you make a wise decision for your smile. Now is the perfect time to invest in yourself with orthodontics. Contact your orthodontist today to take the first step to a straight smile. Dr. Amin Mason is an orthodontic specialist who provides tailored solutions for his patients. He regularly continues his education to provide his patients with the latest orthodontic treatments. He will align your teeth and bite to improve your oral health and self-esteem. To see which treatments are right for you, contact Polaris Orthodontic Center today to schedule your consultation. Comments Off on Should I See a General Dentist or an Orthodontist in Columbus, OH?